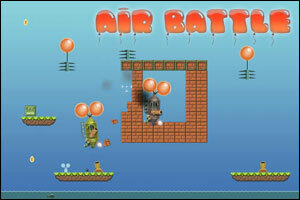 Air Battle is a physics-based action game with puzzle elements created by Alexey Egoshin and Eugene Karataev from Island Games. Guide your armed balloon through 20 challenging levels, avoid accidents and shoot down any enemy balloons you encounter. A nice game while it lasts, but a few more levels would have been great! How do you get past level 16? I’m STUCK! I can kill the enemy and open up the hole in the wall but i CAN’T FIT!!!! Level 19 you need to have both your balloons at the end. Pop the other vessels balloons with the bottom of your vessel then kill the cannons. Then fly into it, it will pop the one and then you’ll advance. Posted on Friday, October 10th, 2008. Follow any responses through the RSS 2.0 feed.